Not all sanding jobs are the same. True success depends on understanding the full scope of the job. The plank size, species, existing finishes and colors, condition of the floor, installation method, and the orientation of the room all make a difference in the sanding method used. This article will cover some of the unique sanding situations that go beyond the standard strip and plank installation. To properly sand parquet patterned floors, first, load the sanding machine with the proper selection of sandpaper. The abrasive selection should be the finest grit possible that will flatten the floor. All cuts should be at a 45° angle to the direction of the wood; this prevents dish-out of the material. Vacuum between all cuts. The second cut should be at the opposite angle of the first cut, using the next appropriate grit of sandpaper, not skipping more than one grit between sanding cuts. All subsequent sanding cuts with the big machine should remain at an angle to the wood grain to prevent dish-out of the material. The cut angle on the floor will be dictated by the many variations in grain direction, species, and condition of each individual floor. Use the last sequenced grit, not skipping any grits between sanding cuts. Typically, the final sanding grit for a parquet floor will be finer than for a strip or plank floor. Use an edger to sand edges and other places inaccessible to the big machine, using the finest grit that will flatten the floor. Vacuum between all cuts. For the final cut with the edger, use the same grit that will be used on the final sanding cut with the big machine. Hand scrape corners, around doorjambs and other areas where the edger cannot be used. Apply even pressure, scraping in the direction of the grain. After scraping, use a sanding block and paper (same grit as on the sanding machine) to blend the flooring. Sanding the bevel with the corner of the block may be necessary on bevel-edged products. Do not sharpen scrapers on raw wood when using waterborne finishes. The filings may cause rust spots or black spots in the finish. Vacuum thoroughly. This is the point at which professionals are separated from everyone else: examine the floor for visible edger and sander imperfections by closely inspecting the floor with bright lights and on hands and knees, then make repairs as necessary. Extra sanding may be required using hand-held orbital sanders, scrapers, or by hand to remove imperfections. 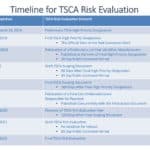 If the result is not satisfactory, the previous steps must be repeated, and the abrasive selection and/or tools used may need to be adjusted accordingly. When using random orbital sanders or other sanding machines to remove scratches, be sure to use the same grit as was used in the final sanding process. Again, vacuum thoroughly. Parquet floors should be final sanded using a hard plate attachment on the buffer, a multi-disc sanding machine, or an oscillating sander to minimize dish-out and uneven flooring. When transitioning to these types of sanders, start with the last grit you used on the big machine and progress to the desired finish grit without skipping any grits. These types of sanders will also mask or alleviate any cross-grain scratch patterns, which may otherwise become apparent on the final product. 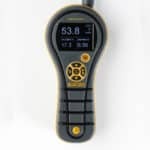 Check the moisture content of the wood floor before sanding to ensure moisture content is at the same level as properly acclimated/conditioned flooring from the installation process. If the floor is installed in an adhesive application, sanding and finishing should occur after the adhesive has cured and the moisture content of the wood has returned to the same level as properly acclimated/conditioned flooring from the installation process. Refer to the adhesive manufacturer’s recommendations for proper curing time. 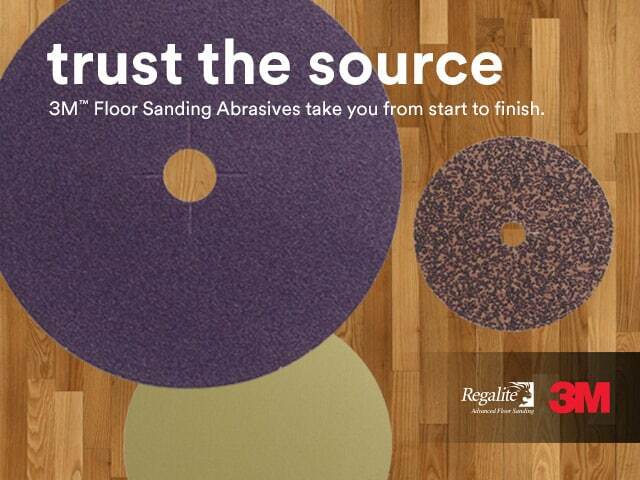 Load the sanding machine with the finest abrasive selection possible to flatten the flooring. It is recommended not to skip any grits when sanding end grain flooring. The first cut should be at a 45° angle to the direction of the installation. Walking speed is slower than normal due to the grain orientation and the subsequent density of the material. Vacuum between cuts. The second cut should be on the opposite 45° angle, using the next grit of sandpaper, not skipping any grits between sanding. Again, walking speed is slower than normal. Each of the subsequent sanding cuts with the big machine should also be at a 45° angle to the direction of the installation. Typically, the final sanding grit for end grain flooring will be finer than for a strip or plank flooring. Vacuum thoroughly. Use an edger to sand edges and other places inaccessible to the sanding machine, using the finest grit that will flatten the floor. For the final cut with the edger, use the same grit that will be used on the final sanding cut with the big machine. Hand scrape corners, around doorjambs and other areas where the edger cannot be used. After scraping, use a sanding block and paper (same grit as on the sanding machine) to blend the flooring. Do not sharpen scrapers on raw wood when using waterborne finishes. The filings may cause rust spots or black spots in the finish. Examine for visible edger and sander imperfections and make repairs as necessary. If the result is not satisfactory, the previous steps must be repeated. When using random orbital sanders or other sanding machines to remove perimeter scratches, be sure to use the same grit as was used in the final sanding process. Vacuum thoroughly. 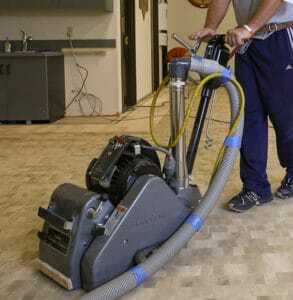 End grain floors should also be final sanded using a hard plate attachment on the buffer, a multi-disc sanding machine, or an oscillating sander to minimize gouging, dish-out, and uneven flooring. These types of sanders will also mask or alleviate any discernible scratch patterns that may otherwise become apparent on the final product. When sanding a distressed or sculpted floor, use extreme caution. Distressed flooring may be classified as hand scraped, wire brushed, textured, or similar. These types of floors cannot be resanded using traditional methods to maintain the textured appearance. Due to the variation in the surface wear layer thickness, these types of floors are challenging and often cannot be sanded. 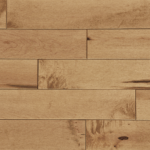 The wear layer may be less than the recommended 3/32” thickness in many areas of the floor, which would become the lowest point that the remaining floor would need to be sanded to in order to get it flat. 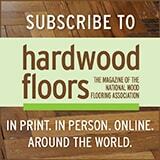 NWFA does not recommend sanding a wood floor when the wear layer is less than 3/32” thick. If you determine the floors can be resanded, the floor will need to be sanded at steep (45°) angles just to begin to get the floor flat. Remember, the steeper the angles, the more sanding with the equipment will be required to remove abrasive scratches. 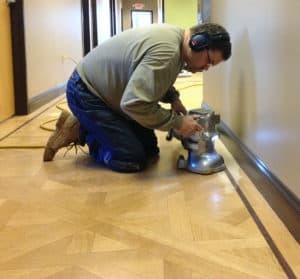 When a sculpted floor is at the point of needing to be refinished, the alternative methods are either scraping, wire brushing, or texturing using alternative methods and equipment. Massive amounts of work must typically be done by hand in order to restore the originally intended sculpture of these floors. Labor costs should be accounted for with this added work. When resculpting an existing floor, the appearance will likely change. Alternatively, recoating these types of floors may often be the best option. Routine maintenance on these types of floors is extremely important to the longevity of the products. Unfortunately, when improperly maintained, these floors are extremely difficult to bring back to the intended appearance. When sanding brass, aluminum, or other non-ferrous metals with a drum or belt sander, be aware that the metals will dull the abrasive at a quicker rate than wood materials. This may cause streaks in the abrasive, which will transfer to the flooring surface. Use caution when using an edger not to overheat the metals, which can burn adjacent wood or cause metal expansion that may lead to adhesive bond failure, resulting in the metal coming loose from the floor (potentially damaging your equipment). If the metal inlay is protruding above the surface of the flooring surface, use a router with a pattern bit to cut the metal down to slightly below the flooring surface, or sand the metal flush using 50 or 60 grit paper. Sand at short intervals and move to different areas, allowing the metal to cool. Thoroughly vacuum the metal filings from the floor surrounding the inlay. When applicable, use a solvent such as lacquer thinner or denatured alcohol to clean the floor before application of finish. Always check with the finish manufacturer for compatible tacking solvents with specific finishes. Stone and tile inlays are common decorative flooring options. When applicable, remove the stone or tile inset and replace with a plywood blank during the sanding phase. Once the sanding is completed, remove the blanks and replace with the stone or tile. 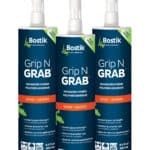 In order to maintain proper expansion space around the stone or tile, use of a silicone or flexible grout caulking should separate the wood from the stone or tile. In situations where the stone or tile is not removable, sand with extreme caution around the fixated flooring material. It is not recommended to sand stone inlays. 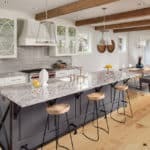 Many trends come and go within the wood flooring industry, but the timelessness of wood is why people will always gravitate toward it as a flooring option. 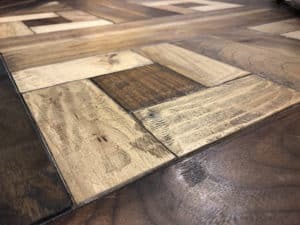 The beauty of being in the wood flooring industry is that almost all wood floors can be, and will need to be, refinished at some point during their service lives. 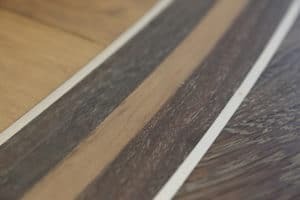 The equipment and knowledge we obtain that allow us the abilities to refinish the many styles of wood flooring are one of the many things that makes our industry unique.